"I grew up on a smallholding in rural Galloway and spent most of my childhood running around the forests and the hills, adventuring with my brother and friends. This gave me a strong belief from the very start in the importance of nature connection, of playing and learning outside, throughout childhood and beyond. After university I worked as an outdoor instructor at the Ridgeways' outdoor school in the Scottish Highlands; as a ringer on an Australian cattle station; a home school teacher in rural Malawi; and a nanny in different countries. I then found my vocation and trained to be a Waldorf teacher at Michael Hall. 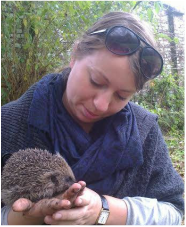 Here I met Vicky Mew and began helping on some Woodland days, which I instantly loved. Each time, I learn so much, and am able to watch the children flourish and learn, at home in a perfect wilderness setting. Although I am still new to Forest schools, and have not yet completed a training, the whole ethos chimes perfectly with my experience and beliefs. I am really looking forwards to developing my skills and experience in this area, as well as working with such wonderful, funny, confident children month after month."